Bus from Penang to Singapore is used to be one of the highly demanding routes. With the start of the budget airline service, the frequency of bus from Penang to Singapore has been moderated. Why Take the bus from Penang to Singapore? Besides that, passengers can always save the precious day time by travelling by bus from Penang to Singapore at night. After sleeping through the night, passengers will be reaching Singapore in the morning. Thus, the 10 hours bus journey from Penang to Singapore sounds long, but the long hour journey will look easy if passengers travel at night. Another advantage by taking coach is that bus is always more comfortable than flight with the full reclining seat and air conditioning environment. Sufficient leg space and thick seat cushion ensure that passengers have a comfortable sleep time in the coach. Konsortium, Newsia and Grassland Express are the few bus operators who provide comfortable bus from Penang to Singapore. The bus fare for bus from Penang to Singapore is about RM 61.75 (or SGD 20.00), with the exception of festive period of Chinese New Year and Hari Raya Haji. By comparing the flight fare and coach fare, coach fare is always much economical. Duration for bus from Penang to Singapore usually takes about 10 hours, depending on traffic condition. Most coaches provide at least 1 washroom break along the highway. If additional washroom break needed, passengers can always request to the driver. Please note that all coaches from Komtar will pass by Sungai Nibong bus terminal to pick up passengers before heading to Singapore. Sungai Nibong bus terminal is another departure point in Penang Island nearby the Penang International Airport. Apart from that, some coaches will drop off some passengers in Kuala Lumpur before continuing the journey to Singapore. 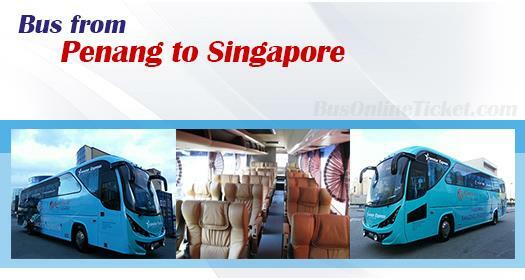 In summary, taking bus from Penang to Singapore is convenient, economical and comfortable. Now it is even more convenient by booking Penang to Singapore bus ticket online at BusOnlineTicket.com with instant confirmation. Do not hesitate now, book your Penang to Singapore bus ticket online in advance to avoid disappointment because of limited available trips.